I was really impressed with the quality and variety I received. So many seeds! Excellent germination rate. Shared with friends. Will definitely be a repeat customer. Best seeds I ever ordered, thanks! I just ordered another big order and still have a lot of last years. Every, single seed I planted grew like crazy; I, had tomato plants grow to over 5 feet and were still producing tomatoes in early December! So, now there will be plenty of seeds for the whole family and we will plant earlier. Best seeds I ever ordered, thanks! Excellent customer service is so rare these days. Thank you so much Linda! I ordered my seeds at the last minute during the Christmas holiday since I needed to take them with me during travels. Linda was very accommodating in taking special care that my order would be received on time. In fact, she took extra time from her day to accommodate my order. I can't thank you enough. I am excited to start planting my seeds! I would definitely recommend others to purchase from you, and I will be ordering again in the future! Great service, great price! Thank you! I love the assortment of seeds in this packet. I plan on ordering three more times from you guys thank you so much. Nice selection and I am very happy with how they grow! Healthy, tasty plants. Thank you! The wife and I have used seeds from (competitor name removed by The Seed Guy) and (competitor name removed by The Seed Guy) and about 50% would grow. We started using seeds from The Seed Guy and at least 98% of everything we planted has grown for us. We Just ordered more for next year. You have the best seed that we know of, thank you. We never had any luck with gardening until we found The Seed Guy. Now we enjoy gardening because of the seeds we get from them, we have a garden. :) Thank you, Seed Guy. Germination is FABULOUS for YEARS! Seed guy, you're the only place I ever order my seeds from now! I've been VERY pleased and I save some of my own every year. But, I've finally worked through the large package I last ordered and I'm ready to order again; probably the Prepper package or another big one. We love your seeds and tell everyone where we order from, the germination is FABULOUS for YEARS! Keep up your wonderful work on the Non-GMO front! I recently got this package and it is exactly as they say it is :) I'm very pleased with it, plus pages of help in planting and saving your seeds for the next year! I bought these last year and had great success with everything. I loved the variety. We tried foods we wouldn't have before. Yeaaa, I love your seeds. Awesome! I bought seeds from them last year, and I'm glad I did!! Love these guys!! Just want to say this is fantastic! Small garden in town, 1/4 acre, but out on the farm also. By the way, every single seed I planted ( ordered from The Seed Guy!) came up and has grown beautifully! Will be ordering some more! More going in this morning as having compost and soil delivered for a new area! Love it! Bought mine for the 2017 growing season. Very happy with quality and quantity. Shared with a few friends. Thank you for supplying a great product at a fair cost. We have the strongest healthiest garden we have ever had thanks to your seeds...stand by for some photos...we are so happy!!! These are really beautiful seeds. Over and above what I expected. I highly recommend. Exceptionally impressed with my order! Exceptionally impressed with my order! Can't wait for Spring! Will be making additional purchases. These are still the best hands down, no one else even close! Do your homework if you doubt it and you'll see!! I can't brag enough about mine. To bad everything a person buys isn't this quality!! I have had wonderful results from ALL of their seeds! They are also such lovely people to do business with. I highly recommend this company. You just can't beat The Seed Guy's heirloom seeds; amazing germination, hearty plants, and WOW...what great results!! I bought my tomato seeds (part of the pack I bought) from you and started the Cherry tomatoes on April 3rd and they were transplanted into my greenhouse on April 17th. They have gone crazy in there; producing a vast amount of food I will enjoy all winter long and they have grown to over 7.5 feet tall! Also, they are fantastic with a very high yield of sweet juicy fruit, but does require a lot of support. Thank you so much - I recommend you to all my friends. Got mine a few weeks ago! I have been wanting some for a long time. I literally cried when I opened them! I can't wait until I can plant my garden and grow food for my family that I can trust is safe for them to eat! I will be ordering again. " Mrs. Seed Guy" took my telephone order and was so nice and helpful. 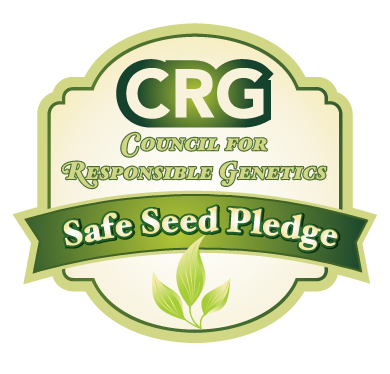 I am so thankful for the commitment that you have made to provide quality heirloom seeds! May God continue to bless your business. Can't wait to plant some seeds!!! My "The Seed Guy" order came today! That's 64 packets of seed happy right there! Whoohoo! I planted some of your seeds in my greenhouse last month. The seeds were almost 3 years old; sealed and kept cool. I'm happy to report 85-90% germination. I'm so happy with the quality of your seeds. Thanks again, and we will be ordering more for spring to keep them rotated.